Following up on the smashing success of El Michels Affair’s Return To The 37th Chamber, EMA drops one more 45 for the collectors. The A side is the crushing cover of the Wu classic “Shadowboxin” off GZA’s cinematic masterpiece Liquid Swords. 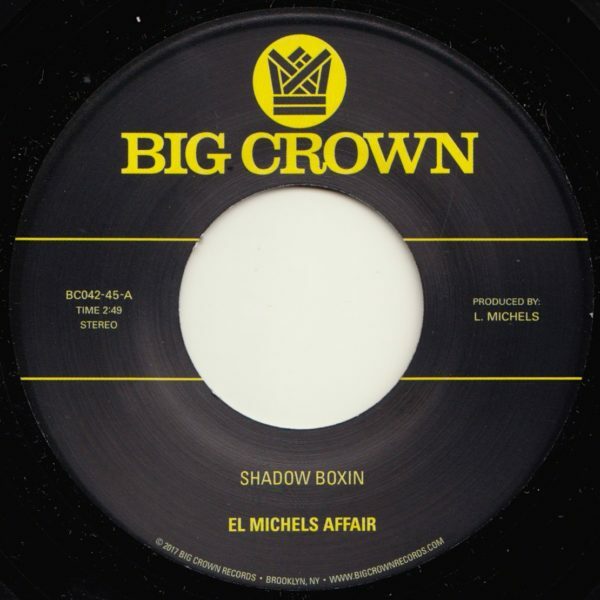 El Michels Affair takes the tune and makes it their own with dancing guitar licks, floating organ notes, and their signature heavy drums. The B side is a treat for the fans, a non album cut, they cover Ghostface’s “Iron Maiden”, the tune that opened up and set the tone for his debut classic Ironman. El Michels smashes this one with a frantic off beat intro that drops into a heavy duty cover of the tune. The inimitable studio prowess of Michels is higlighted all over this track in the nuances and arrangements. Play it loud, and also smoke something and play it in your headphones. Another Big Crown sureshot.